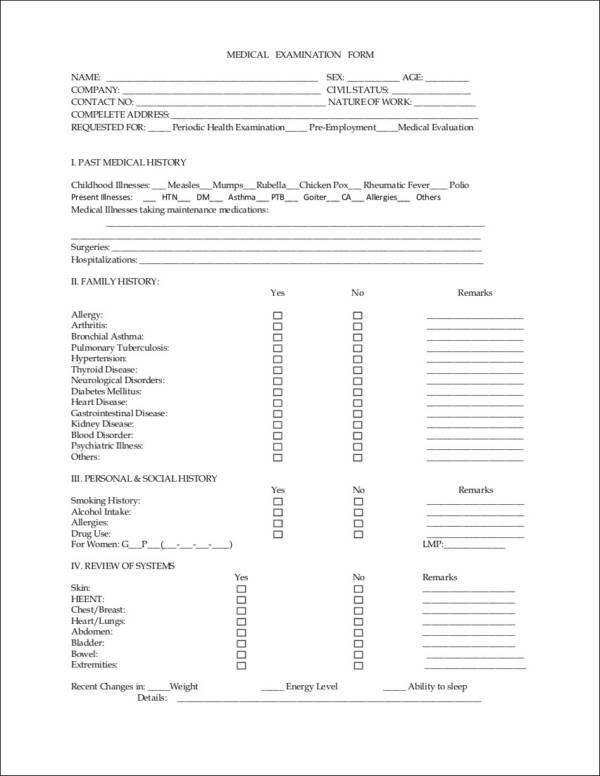 Medical evaluations are done for a number of reasons and they are specifically done based on what needs to get evaluated. An individual needs to ensure that they are aware of their medical conditions as it is their responsibility to take care of their well-being and overall physicality. 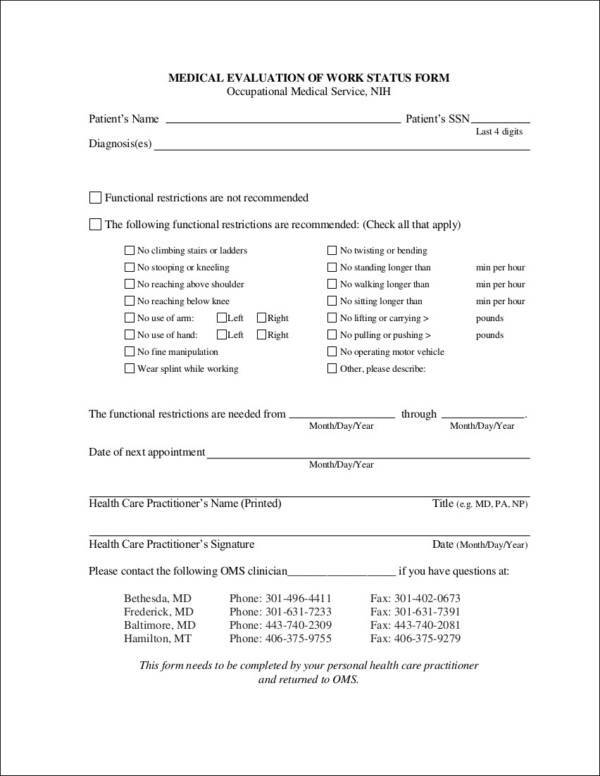 It is essential for medical conditions to be evaluated according to proper medications to be given to the patient. 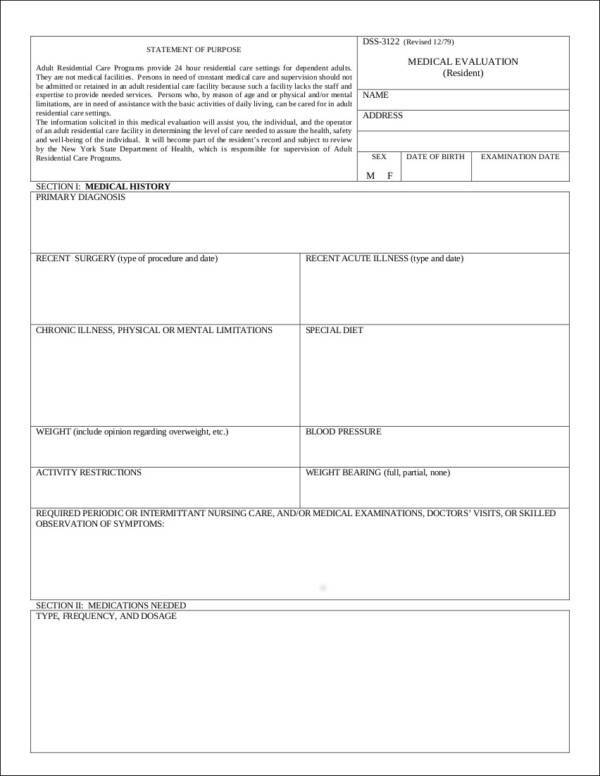 This is why medical evaluation forms are used by hospital and other medical facilities so they can have accurate data that are usable for assessment and document safekeeping. 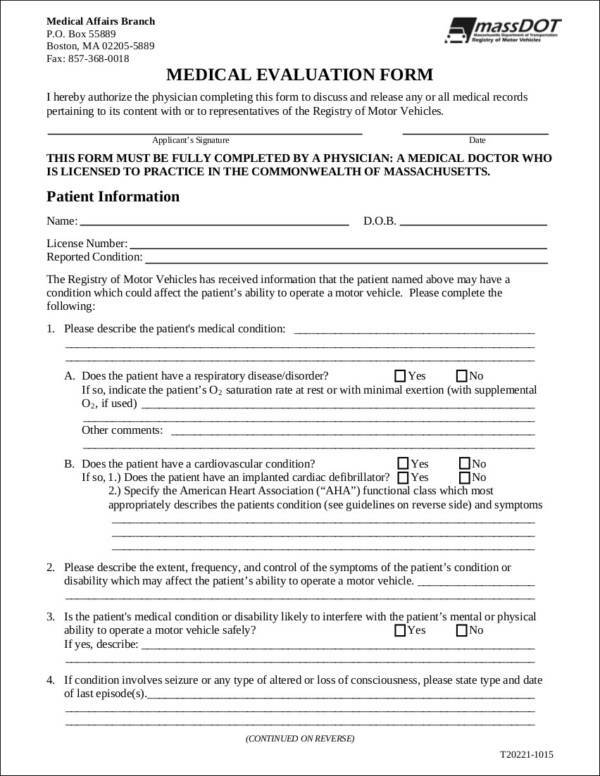 Since there are different cases that are faced by medical institutions on a daily basis, the content of a medical evaluation form may vary. 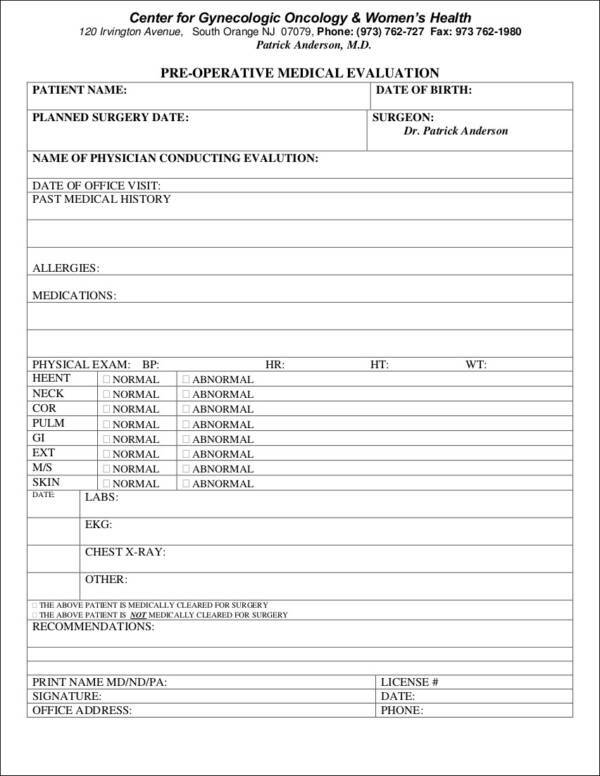 Be aware of the items that you will place in a medical evaluation for as it can affect the entirety of any medical procedures that will happen. 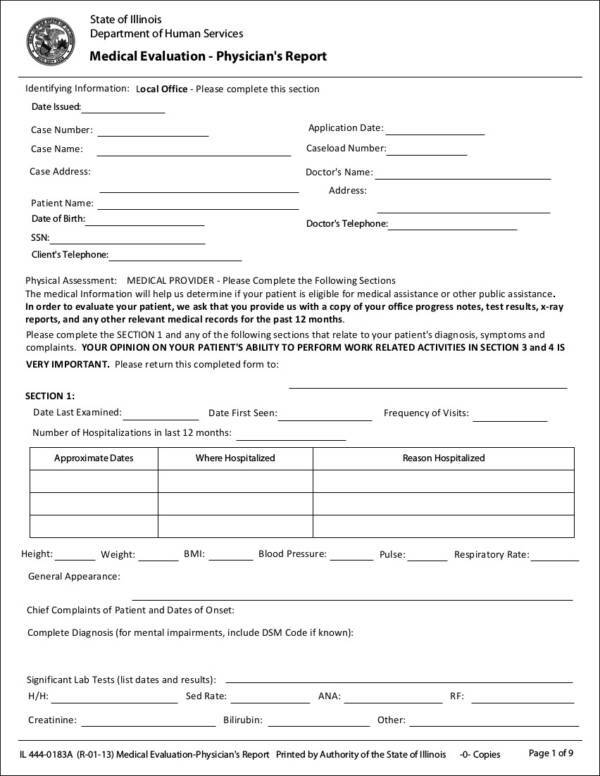 It will be best if you will take reference on various templates of this kind of form so you can easily have a well-formative and thoughtfully curated medical evaluation form. 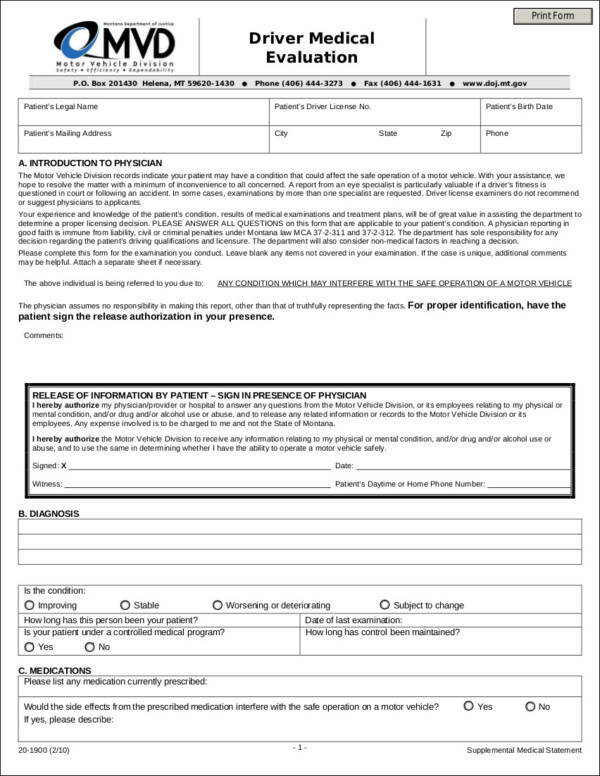 In this article we present to you 10+ medical evaluation forms that you can download for free. 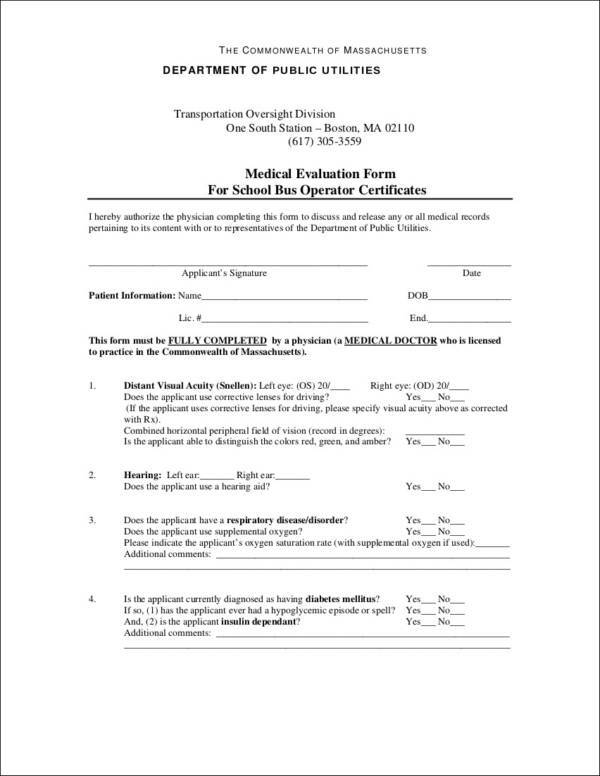 We have included a variety of these medical evaluation forms so that you can choose one that is appropriate for your needs. 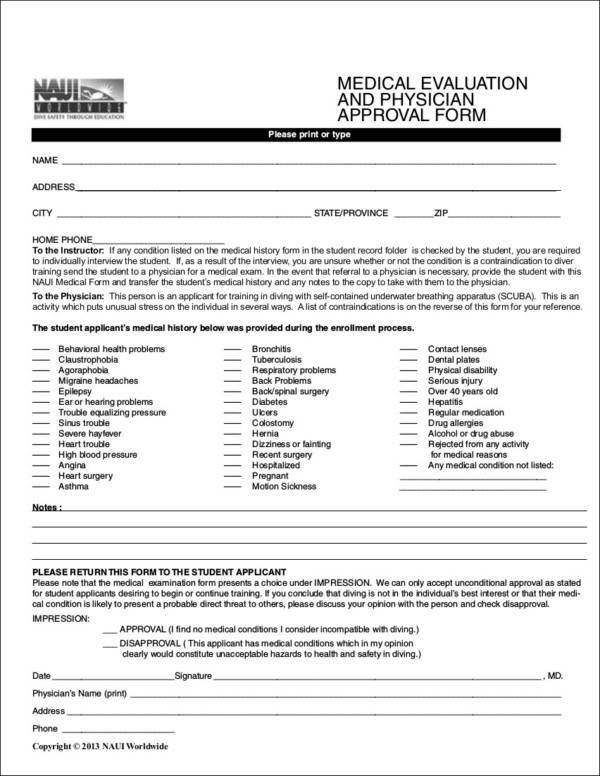 You may use these medical evaluation forms as reference for your study or if you need to make one for your own. A medical evaluation is sometimes referred to as a medical examination because it is done to identify any existing health problems or issues that an individual might have. Being able to identify the existing health issues helps an individual to seek medical attention and get the appropriate medical treatment that they need. The sole purpose why medical evaluations are done is to be able to conduct a comprehensive medical assessment on an individual. This comprehensive medical assessment helps in pointing out health problems and prepare a lesson plan for the treatment that needs to be undertaken. 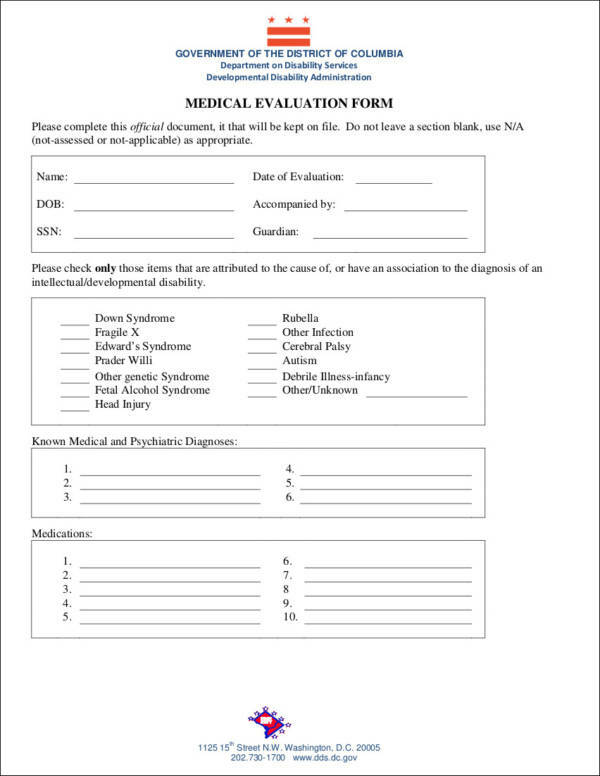 Medical evaluations may be requested by individuals themselves or it may be required by certain companies. 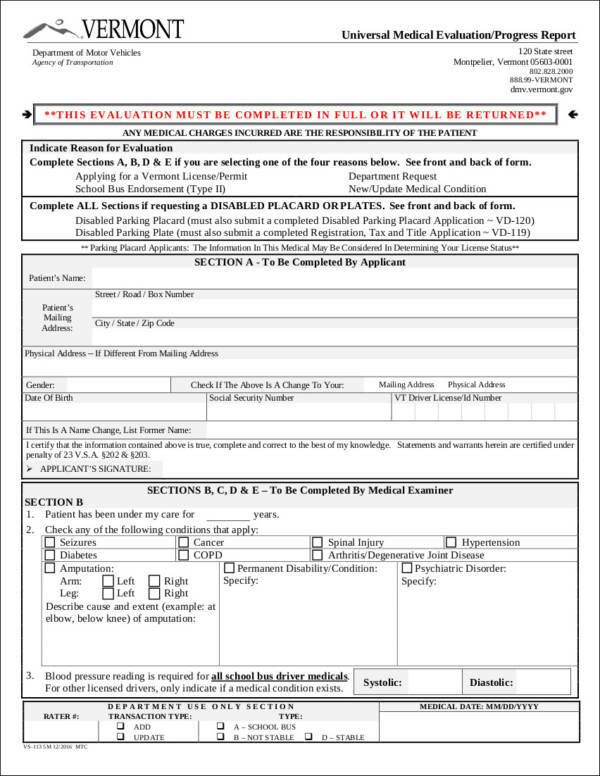 A medical evaluation may be required during annual physical examinations to determine if the employee is fit and free from any health hazards and free from contagious diseases that can affect other employees. 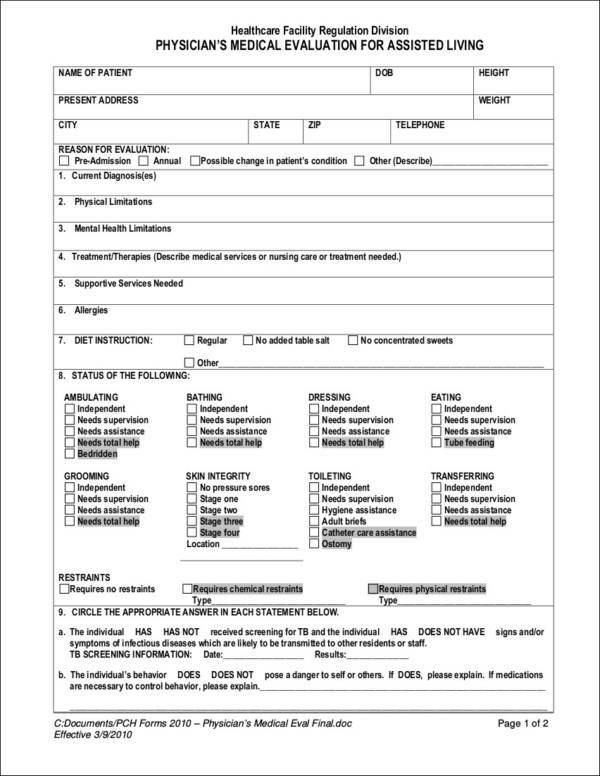 It may also be requested when an employee returns to work after being absent or after being on leave because of an injury or a sickness. 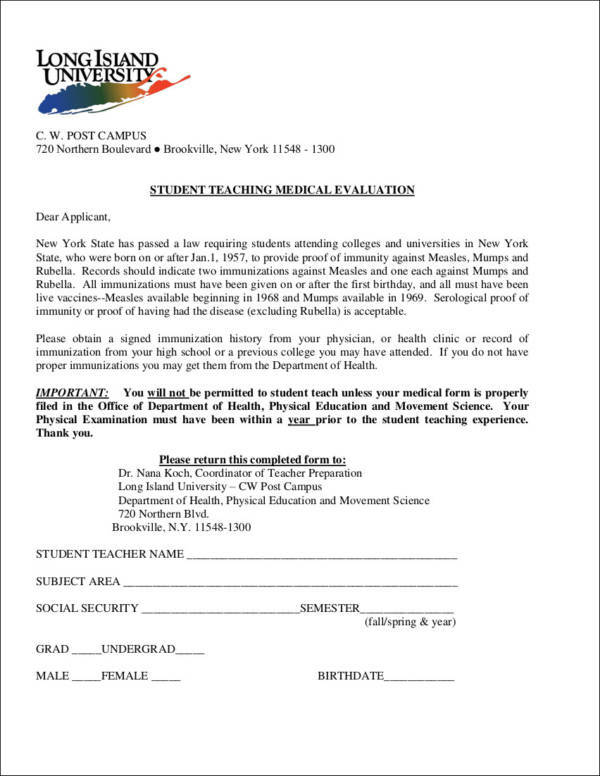 For that, they have to fill out a return to work medical form together with their medical certificate. The type of evaluation being used should be one that is appropriate for the methods of evaluation. It is important to plan first what type of evaluation is good for the method as this will make the process run smoothly. It will also make the evaluation process effective. Below are the types of evaluations that you need to know, including their uses. When a new program is being developed, the type of assessment being used is a formative evaluation. It does not only apply to new programs, but it is also used when an existing program is being developed to be able to meet different needs. An example would be to modify an existing program because of location change or a change of target audience. It shows if the elements in a program are needed and if it is possible to perform the said sample evaluation based on the set goals and objectives. A formative evaluation is used to modify a plan before it gets completely implemented and allows to make changes before it gets finalized. It is also likely that a program will succeed if this type of evaluation is used in its creation. It includes cost analysis, cost-benefit analysis, and cost-effectiveness evaluation. It shows the cost of the resources being used in a specific program. This type of evaluation is used at the beginning of a program and before an existing program starts to operate. It is a way for program managers to asses how effective a certain thing is based on its cost. An impact evaluation shows how a certain action or intervention affects the goals and outcomes of a certain project, regardless if it is something intentional or unintentional. An impact evaluation is done while the operation of a program is being performed, and at the end of the said program. It is called outcome evaluation because it is used to document the process on how a program template is implemented that lead it to provide such outcome. An outcome evaluation is used at the end of a program or after it has made contact with the target population of the evaluation. It is used to measure the effectiveness of a program to the target audience and whether it is able to meet objectives. This type of evaluation shows if the said program being evaluated is working or is effective. It provides a warning for any problems that might occur in the future. It is used at the beginning of a program and while the program is still operating. An example of the said evaluation is program monitoring. How Does an Evaluation Differ from an Assessment? We often confuse an evaluation with an assessment. In some instances, we use them interchangeably to mean the same thing. We have been practicing this for quite some time now and it is really hard to distinguish one from the other. This is especially the case in the medical setting because they have to do a lot of assessments and evaluations that the word seems to have exactly the same meaning. An evaluation and an assessment sample have quite a lot of differences and they don’t really mean the same thing. An evaluation is a systematic way of collecting and examining a thing or an individual based on the appropriate or specific standards. Since it is based on given set of standards, when an evaluation is done it will provide a rating, a score or grade for the said performance or something that has been evaluated. Also, an evaluation is used to measure a particular thing being evaluated, and whether it has met the required standards or not. In the case of a medical evaluation, it is the health of a certain individual being evaluated. 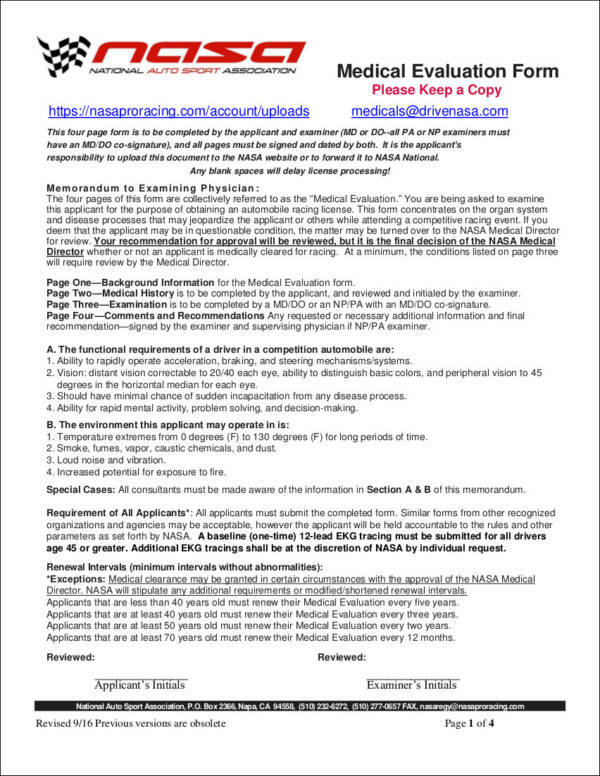 These evaluations could be in the form of a pain scale or the APGAR Score. An assessment, on the other hand, consists of collecting and analyzing data and other related information to help improve an individual’s performance or the performance of a team or thing. An assessment is usually done to determine the areas where a thing or an individual needs to improve on so that it can be addressed and fixed accordingly or based on the desired outcome. Formative assessments are conducted so that feedback can be given after the entire process is done. For example, after doing an employee assessment, the employees are provided feedback on what has been identified as the problem on why they are not making improvement or on why they are not doing good with the job. Not all assessments are conducted to find fault or problem to things. Assessments are also done to identify the strengths of a certain individual or thing so that they can be praised and rewarded accordingly. Those are the things that make an evaluation different from an assessment. Perhaps, the defining thing that makes an evaluation different from an assessment is the part where one uses a set of standards while the other is used to determine the strengths and weaknesses, or areas that need to be improved. So the next time you come across these words, you are sure to know their differences. You may download the 10+ medical self-evaluation samples available in this article. They can be downloaded free of charge. You don’t have to sped a penny to be able to get these awesome samples. Get them now!